South Wilts Ladies cricket section is still relatively new, but very enthusiastic and welcoming for new players. The 2017 season is our first league campaign, which is giving us good number of games to play, alongside the regular Monday evening training slot. This runs from 7.00 to 8.30 at the Club on Wilton Road, all players are welcome to come along and try us out. We work alongside the girls section, and are pleased to have been able to include some of the older girls in all of our fixtures this season. Alongside the regular training, starting next Monday 26 June from 6.00 to 7.00, we are running the first of a free 6 week set of softball cricket sessions. 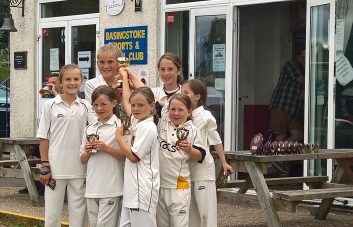 This is being run with Wiltshire Cricket, and the aim is to help introduce ladies to the sport, or reintroduce ladies who haven’t played for some time. All of our sessions are run with qualified coaches, and we provide all of the equipment that you need. If you are interested in coming along then please do get in contact with Nigel Sell on nigelsell@aol.com or 07730 790234.